This DVD video about mountain bike repair will set you free from the high costs of repairing your bike through bike shops! If a picture is worth a thousand words, a video is worth a thousand service manuals. 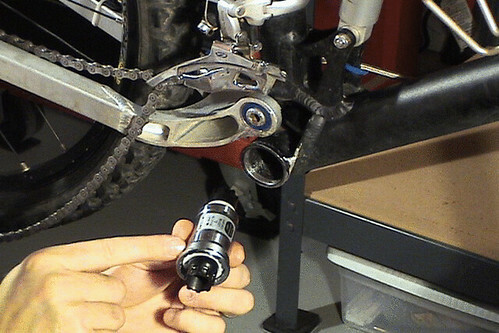 Although this DVD is geared toward mountain bikes, the tips and techniques can be applied to road bikes as well. We don’t waste your time or money on fancy packaging, trail videos, or fluff. This dvd contains only repair and maintenance clips so you can fix your bike quickly and easily.We have tried to select components that are common. If you don’t have the same components,that’s ok, your adjustments, etc will be similiar. I am 5?7?, 180 lbs. I ride a Giant Warp DS 2 for trail riding and a Giant Cypress LE for my daily commute. I also own a 7 speed Gary Fisher Tarpon. I am mainly a XC rider that will occasionally have too much fun on my Warp. I am also a bike commuter traveling 10-20 miles each way. I’ve used this DVD on my Giant Warp, Gary Fisher Tarpon as well as a Raleigh M80 and the Ibex Corrida. Each bike varied in what type of repair or maintenance was performed. Awesome DVD! The video is menu driven which means a person can click and choose which part of the bike they want to work on. The mechanic was very thorough with his instructions and he goes into great detail on how to execute the task. No other options right now. -I couldn’t see any weaknesses, other than this was focused on mountain bikes. But the same mechanical principals apply for road and hybrid bikes. This DVD is what the Local Bike Shops (LBS) do not want you to see! The video can literally save you hundreds of dollars per year. I was genuinely impressed on the knowledge the folks at Video Bike Repair have. Each technique worked, I know because I tried them myself and my bikes perform better than the day I bought them. I liked how the DVD made everything easy to understand. I loved the section about derailleurs because I am always fidgeting with mine. I know that once you watch this DVD you will be blown away! The DVD look great, maybe in the future could purshased. For now my mind is overwhelmed with a new similar course that i am taking.